Office Wear and Casual Fashion Prints for the Urban Woman In very Soft Cotton for the Rich Feel. Office wear / Casual Wear modern day prints in very soft cotton fabric and three quarter sleeves. Length 45"
Office Wear Modern DAy Prints in Very soft cotton Fabric and Three Quarter Sleeves. Length 45". Office Wear Modern DAy Prints in Very soft cotton Fabric and Three Quarter Sleeves . Length 36"
Casual Cotton Kurti. Length 45"
Casual Cotton Kurti . Length 45"
Beautiful Colors and Aesthetically Stitched Long Cotton Kurti making it a very trendy wear. This kurti is made with Suoer Fine Cotton fabric with a very soft hand feel that is high in comfort. Length Long 50". Packaging Details: Single Piece Poly Bag with ISHIMA Brand Label and Tags along with proper wash care instructions. Beautiful Colors and Aesthetically Stitched Long Cotton Kurti making it a very trendy wear. This kurti is made with Super Fine Cotton fabric with a very soft hand feel that is high in comfort. Length Long 50". Office Wear Modern DAy Prints in Very soft cotton Fabric. Packaging Details: Single Piece Poly Bag with ISHIMA Brand Label and Tags and proper Wash care Instructions. 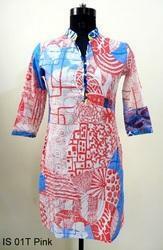 Looking for ISHIMA Cotton Kurtis ?